Please find the link below to the compatible cartridges for this machine. Your HP 8000 Wireless prints beautiful photos, but how are your ink levels? After some time your HP 8000 Wireless will consume all of your printer ink, and when it does you'll soon discover that fresh HP 8000 Wireless ink is typically an expensive affair. Fortunately you don't need to get stressed about coughing up the steep purchase prices you'll get on the high street because here at Cartridge Save you can buy all the HP 8000 Wireless cartridges you will need at low cost. Start to save cash on your ink by ordering online with Cartridge Save! Why spend so much on the 8000 Wireless original cartridge or 8000 Wireless compatible ink on the high street when it is much easier to save your hard earned cash shopping online with Cartridge Save. You can have total confidence when ordering OfficeJet Pro 8000 Wireless ink cartridges from us because they all are underwritten by a no quibble money back guarantee. Keep in mind that each and every order comes with free delivery, typically delivered to your door next day! A single-function inkjet, the HP Officejet Pro 8000 Wireless fares well with its competitors, even producing better quality prints than some lower-end colour laser printers in the market. It is an office powerhouse with impressive print speeds and high-quality outputs. Setting the printer up is a matter of clicking through a series of dialog boxes, though this may take time especially when configuring the wireless set-up. Opinions on ink consumption vary, but greatly depend on the nature of use. The HP Officejet Pro 8000 Wireless is a decent laser-quality inkjet offering wireless connectivity. Minor issues involve ink price and photo quality. It is bulkier than other single-function printers from HP, measuring 19.5x18.86x7.09 inches (WxDxH). The HP Officejet Pro 8000 Wireless is also not the most portable model, weighing a little over 17 pounds. It features an automatic duplexer unit for printing on both sides of the paper; an optional 250-sheet paper tray can be added to the 150-sheet standard tray. 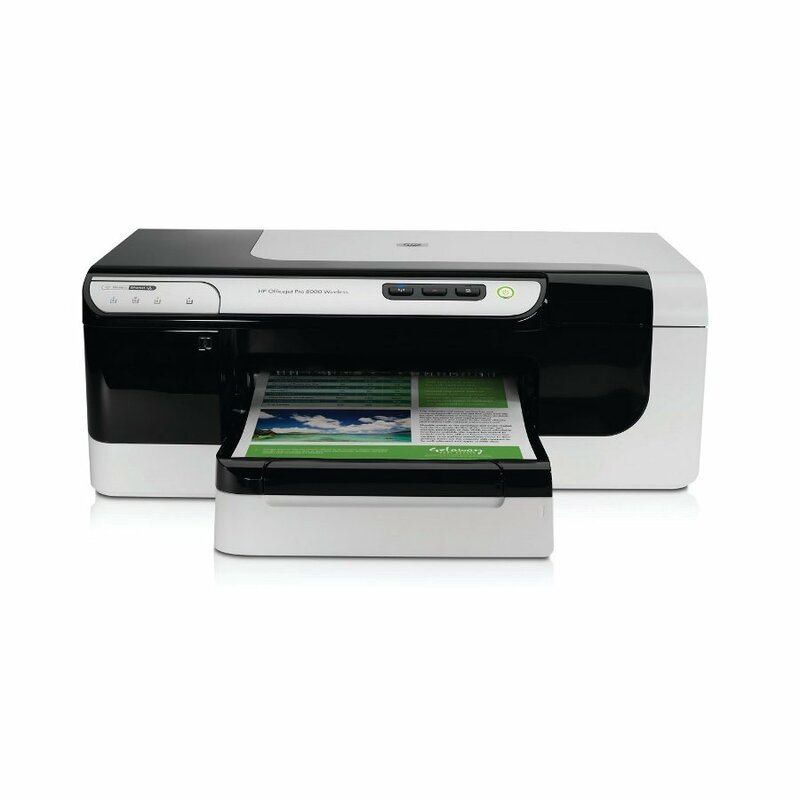 The HP Officejet Pro 8000 Wireless has onboard controls for resuming or cancelling print jobs, as well as for using the wireless set-up. Prints come out pretty fast. The HP Officejet Pro 8000 Wireless prints out graphics and web-pages at a rate of 4.2-4.7ppm; photos print at a slower rate. Text printing speed is 10.7ppm. Wireless connectivity is also a huge plus. While it is arguably one of the best text printers around, the HP Officejet Pro 8000 Wireless sometimes fails to print true colour, especially when it comes to flesh tones, which tend to be orangey. The printer also makes loud noises before and while printing, and ink costs can be high.